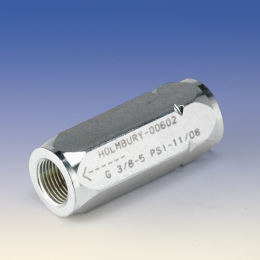 Holmbury check valves are available in sizes from 1/4″ – 2″ in various cracking pressures. Some pressures maybe be more readily available than others, please contat us to find out or click the link below for technical information. One-way valve for in-line use. Suitable for any type of hydraulic system using liquids that are not highly viscous. The standard types are in zinc plated carbon steel and are therefore especially suitable for non-corrosive mineral based oils and liquids.